kiloview E1 h.264 sdi over ip encoder video from Changsha Kiloview Electronics Co.,Ltd. HD/3G SDI Encoder E1 is a professional HD/3G-SDI H.264 video encoder. Small size and ultra-low consumption design! E1 comes in 1.485G HD-SDI, 3G-SDI input, and SDI looping out. Input SDI signal through preceding image processor for image enhancement, then encoding by SOC processor for creating H.264 video encode featured with high performance and low bit rate. 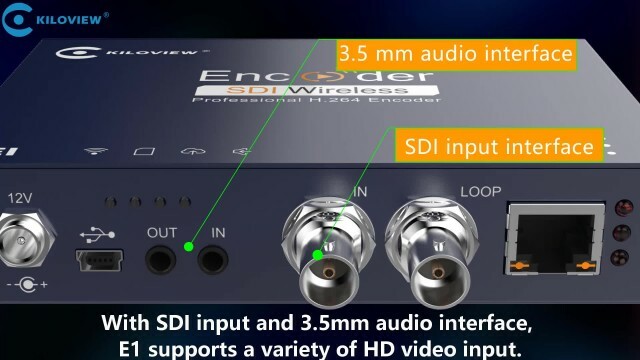 HD/3G SDI Encoder E1 supports unbind audio from SDI signal, also input audio from Analog Line-in for AAC (MPEG4-Audio) stereo audio encoding or G.711 audio encoding. HD/3G SDI Encoder E1 allows you to manage and preview video through WEB management. Easy operation and multilanguages supported for worldwide users. 00:44 Kiloview G1 4G Wifi Live Broadcast Video Encoder Changsha Kiloview Electronics Co.,Ltd.